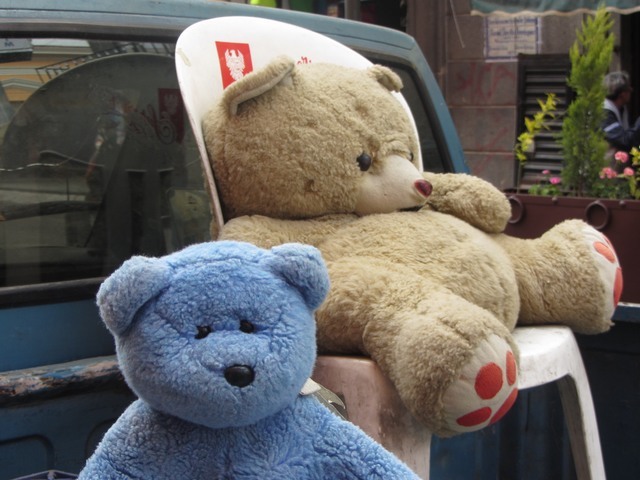 This entry was posted in Mexico, Picture This and tagged Blue Bear and Friends, Learning a language, Mexico, Street Scenes, Word of the Day by The Adventures of Blue Bear. Bookmark the permalink. Maybe the tie is for women to admire and a dress is for the men to admire… Ha! Every language seems to have it’s quandaries. I know the word in Kayah for want is sey thu, so I asked Prey Rey what do you use if you say I “like” your dress. He said you use the same word Seythu. To me like and want are vastly different. So OK, what if you want to say I like Prey Reh? He thought and thought for a long time and then said it is the same but we don’t say that (for obvious reasons) then he gave me the word for appreciate so n so. Basically it is something they don’t say. That is funny. Yes like Spanish has two words for to be (is, are, etc.) and two words for for but the rules for using them are so obscure that I cannot figure them out. So basically I use one and if someone looks at me quizzically or says huh? then I try the other.